When I was writing my last post I noticed that I have forgot many details on my crafting in January already. I think I should jot down some info on recent projects before I forget the details. I did a crazy amount of crafting in March and April. I did over one finished project a day. The week before Easter I think I finished 5 projects each day. I don't want to forget the how, why, likes and don't likes with my projects so I figure I better start jotting it all down. 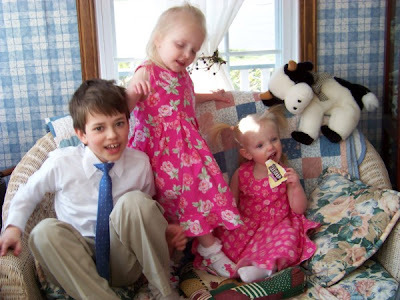 About 2 weeks before Easter I bought a pattern and fabric to make my girls Easter dresses. Let me first tell you all that I HATE PATTERNS and hardly ever use them! Personally I feel buying patterns is a waste of money for me. I have friends and family who are pattern collectors and they love and cherish the patterns they own but I am not that type of person. I find it hard to follow other peoples written instructions (especially the type with random line sketches for pictures to follow). I personally would rather take an old sheet (or fabric from the $1-$2 discount bins) and cut up to create my own patterns. It is easier for me to make something from a picture in my head than to follow a strangers step by step instructions. Knowing all of this I was a bit reluctant in buying a pattern for around $2.50 and fabric 4 yards at $2.50 a yard. The reasons I decided to take this step out of my frugal no pattern buying habits are. 1. I knew the 4 yards of fabric would work perfect in my girls room (curtains, pillows, and such). If I could not get the dresses made the fabric would be put to good use. 2. I used my personal allowance to buy the supplies. I figured using my own cash (not taking money out of our clothing budget) would take the pressure off me. I always feel obligated in having things turn out perfect if I use family money to make things for the girls. 3. I convinced myself if I don't force myself to buy and follow a few patterns I will never learn how to use them. 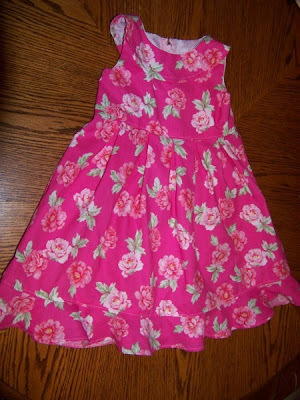 The pattern I bought was New Look 6577. I did NOT like this pattern at all!!!! I found it very confusing! I wasted WAY TOO MUCH TIME on trying to figure it out! I think it was lacking in the instructions! I even showed it a few times to my hubby and he agreed he did not see writing or pictures to go along several steps. It shows how to sew front to back under arm to waist in pictures and tells exactly how to do it BUT I didn't see how to do the rounded yolk at all! I struggled for 3 days on this and I am sure I didn't end up making it like the instructions because the way my dresses turned out I had to top stitch to make it lay right. I am sure someone who uses sewing patterns all the time would be able to figure it all out a lot better than I could. My first try at making the dress I used an old sheet for fabric. Well, OK, to be honest it wasn't my first draft. 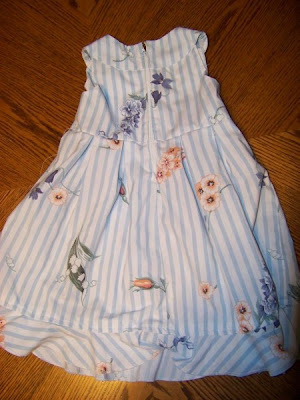 I have several cut up sheets in many colors, of this dress, all partially sewn, laying all over the house. I tried sewing the yolk over and over until I got it to work out. 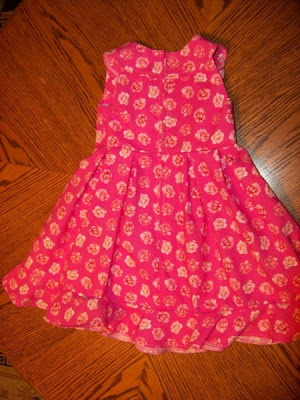 In the next few weeks, as I come across all my failed attempts at this dress, I might decide to fix and finish them for more play dresses (or I might tear them up for cleaning rags). Anyway, here is a picture of the first FINISHED try at this pattern. Let me first say that I know (and knew ahead of time) that stripes would not work out the right way with this pattern. It is only a play in the mud dress for my middle child. I had cut up so many sheets trying over and over to get the top of the dress together I grabbed this striped one for one last try (I was just about ready to give up on this dress pattern). My hubby said he can't stand seeing the sideways stripes at the bottom of the dress but like I said it was more a test run than trying to make a real dress out of this sheet. Less than a minute after finishing this dress Demi was stomping in a mud puddle (our neighbor was giggling when he heard her say look at my new dress when stomping in the mud). 30 minutes later she came in the house with it covered in mud spatters. I have to say it is working great as a play around the house dress. The sizing was very big. I made a size 2 for my youngest and it is a bit big on my 3 (almost 4 year old). I made this one a size 2 just to check the sizing. Below is a picture of the back and my very messy zipper. I was in a rush to finish it up so I rushed with the zipper so I could get the real dresses started. For the real Easter dresses I ended up making Demi a size 2 (I should have made it a size smaller). This one went together much quicker but I still had to top stitch to get it to lay right. BTW I am sorry I didn't take the time to hang the dresses to get a nicer photograph. It was just before Easter I guess I felt I was too short on time to hang them for pictures. To be honest I am kind of surprised I took the time to snap pictures of them laying on a table! I remember it being a bit of a hurry, hurry, rush, rush, sewing project. Not the nicest looking zipper in the back. It works well and she has very long hair that covers it so I guess it is no big deal. I know some people can't live with imperfections in sewing projects but I am not like that. I view it this way. 1. 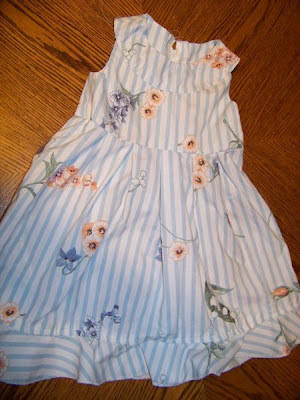 I see lots of sloppy sewing in many of my girls expensive store bought clothing. 2. If nobody will see it why waste time fixing or worrying over it (my daughters hair covers it so feel I can live with it). 3. If I spend days ripping out and redoing a simple project I would be giving up the time I feel could better be use for making other stuff. I love the crafting part (it's the drafting the pattern, cutting, ironing, sewing part I love) I could care less about the making a perfect finished item. 4. I never care if my children ruin an outfit I can let them be children in anything I make (staining, tearing, and wearing out the clothes I make just gives me a good excuse to make more). 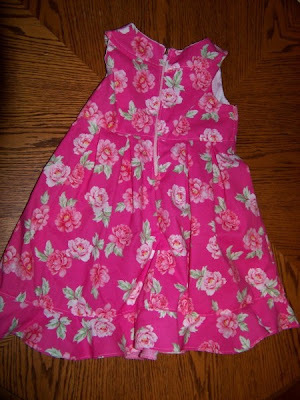 After Demi's dress I sewed up one for Zee. I made a size 1/2 for her. This was the smallest size on the pattern. It is a bit big on my very chunky 18 month old (yet another reason to make my own patterns)! before starting this one I once again read over the instructions and I still thought they are missing info on how to make this dress! I was just as confused as I was reading it the first 20 times. 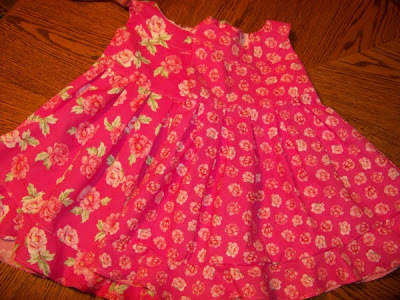 This dress sewed up quick and I had lots of time to finish before the holiday. It ended up a bit neater looking (I think) than the first two tries. This dress I took the time to serge all the edges. I thought all the rough edges inside Demi's dress looked bad (pattern does not have you finish any edges on the inside). Here is a close up of the zipper. This zipper did end up looking nicer than the first two but that isn't the reason I took this closeup. I think I took this picture because I finished the dress up with lots of time to spare (I think it was early morning 2 days before Easter I finished it up). Here are both dresses together. 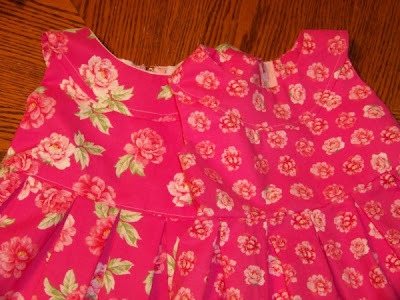 Dress on left (larger flowers) is Demi's (my 3 year old) and dress on right with smaller flowers is Zee's (my 18 month old). If you are wondering why my handsome son's hair is a mess this picture shows why.... Yes, that is Demi's hand messing up his hair! 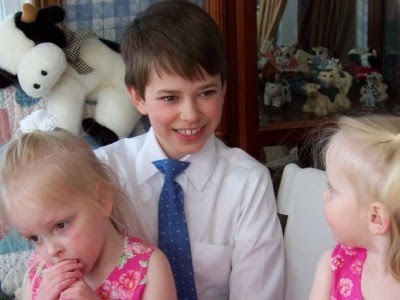 Just to show you how handsome Travis looked before Demi messed up his hair he is a before shot. He had such a nice pose. It is a shame the girls had no interest in giving smiles! OH! 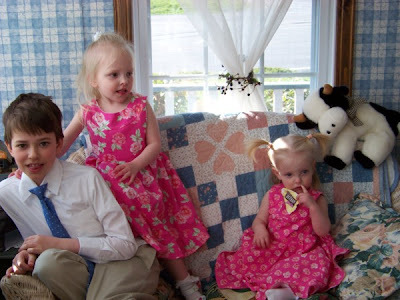 I have a few more Easter clothing pictures to share! SOCKS! I can't forget the socks. After finishing the dresses early I felt like I wanted a quick craft to keep me busy (after all busy creative hands are happy hands). I was mending socks I knit for my mom at the same time I was making the Easter dresses. I guess that put socks on the brain. 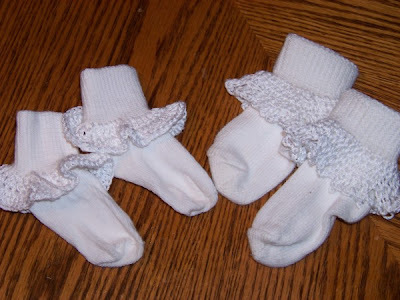 I knew I didn't have time to knit up 2 pair of child size socks before Easter. Demi has several store bought ruffled socks most are looking a bit old and worn (most of hers are the ribbon kind). The only still looking white socks she owns is the plain no frills ones (she doesn't like to wear the dull looking ones so they get worn less). I picked out some no frills socks from the dresser, I grabbed my crochet hook and some thin yarn and started playing around to dress up some socks. 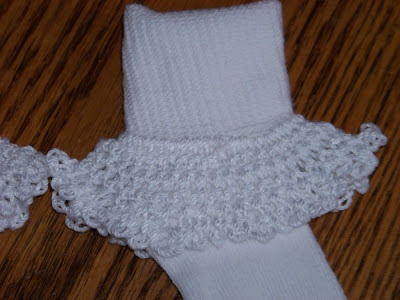 I just randomly stitched into the socks and crochet a ruffle looking trim. It turned out so much nicer than I thought it would! Often when I get an idea on my head my first tries and finding a way how to do it end up not working out. This was simple and turned out nice. I didn't buy any patterns to do it. I just did a few rows around and ended up with fancy socks. In the picture above the socks on the left I did for my trial socks. They are socks that I could see one of the children have worn a few times (they aren't as white as the other socks I used). Demi took off with them on her feet 2 seconds after I snapped this picture. You should have seen how happy she was dancing around with her new socks (socks she refused to wear before the ruffles lol). The socks on the right I made for Zee to go with her Easter outfit. The next day I whipped this pair up for Demi so she had a new looking set for Easter (shhhhh please don't tell the people at church or my family that they are not brand new socks). Close up of Demi's socks. I LOVE the look crochet gives an item! Crochet anything is beautiful in my eyes. I guess that is why I like a bit of crochet even on old socks! I must admit to everyone and make sure you all know I didn't buy new socks to add the trim on. I used what we already had and I feel I should share my reasons for doing it this way! I figured if I picked out the newest looking plain socks and added trim to them it would save time (no driving to the store) save money (using what I have is free) and I used my practical (never strive for perfection) rule of thumb.... 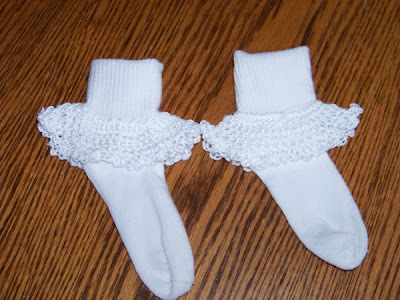 I know once white socks have been on a little child's toes for a few minutes (under 5 minutes in most cases) they are no longer white, shinny, and new looking (even on the cleanest floors they pick up dirt). I view socks as reusable (wash and wear again). So although my newly finished project pictures above don't have that first out of the package new look it makes no difference now!!! They now have marks on the bottom of the feet that didn't all wash out. They look like my girls ran around most of the day on Easter in just sock feet..... Well, that is because that is what they did! I guess that means they like them (they usually take off socks after 5 minutes). My girls love the lacy socks and don't seem to care how white the bottoms are. LOL! I just took a rubber band (the kind I already use for Demi's hair) and I copied something similar to what I did on her socks and ended up with a matching hair accessory to complete her outfit. I ran out of time to make any for Zee. She has a lot less hair so making something would have taken a bit more thought. 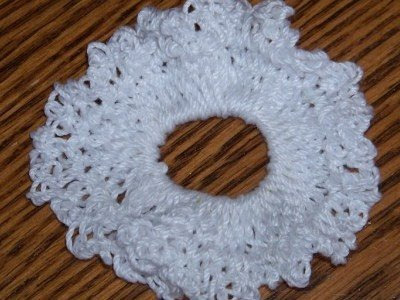 Maybe next time I am looking for a quick project I will give a try at making some baby sized crochet hair accessories. So now taking a look back at my Easter sewing and crochet projects I need to make some notes to myself. 1. I didn't like the pattern and don't plan to ever use it again! 2. My next 3 dresses I will draft my own patterns from scratch. 4. I am happy not being perfect and I guess I am OK with sharing my not perfect work. 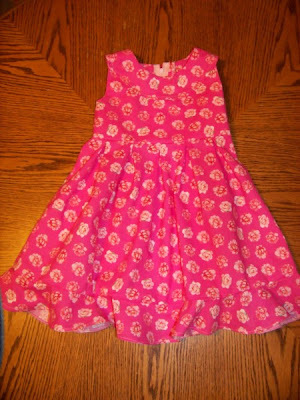 I would love to have perfect dresses like we see on other sewing blogs but I am not willing to spend a week on a project to get the perfect dress. In the end I am happy that I used that time making a hair accessory and fancy socks! 5. Remind myself how sharing how to take used (not perfectly looking new) socks and adding fanciness to them is OK. Everyone keeps saying they are counting every penny in this economy so maybe showing how to dress up something like old socks can be helpful to someone else. BTW the yarn only cost $1-$2. for a ball that will do a large amount of child size socks. 6. 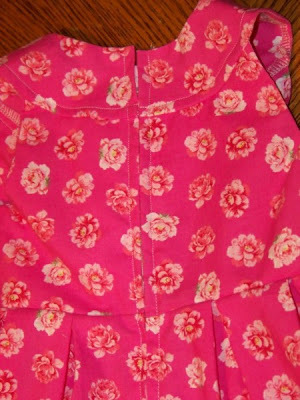 Using a sew the seam shut then add the zipper is the best method for me to sew in a zipper. All other ways are HUGE flops for me! 7. Reminder for next holiday.... Fabric cost under $2.5 a yard and I bought 4 yards. I have lots of fabric left over and in total spent under $10 for 2 dresses! I spent less money on 2 dresses than a discount store (walmart/kmart) sells one dress for and odviously I spent much less money than all the other popular clothing stores. 8. Money on pattern was a waste of money for me. I need to remember that although I am not the best at sewing I am able to make things that fit nice on my girls without using any patterns. Silly me thought buying a pattern would save me time (wouldn't have to mess with several failed tries in pattern drafting). I found I was WRONG. I ended up making more messed up attempts following a pattern than I would have had creating my own! I need a bit more faith in my own pattern making abilities. I hope jotting all of this down will help me remember all of this months from now.